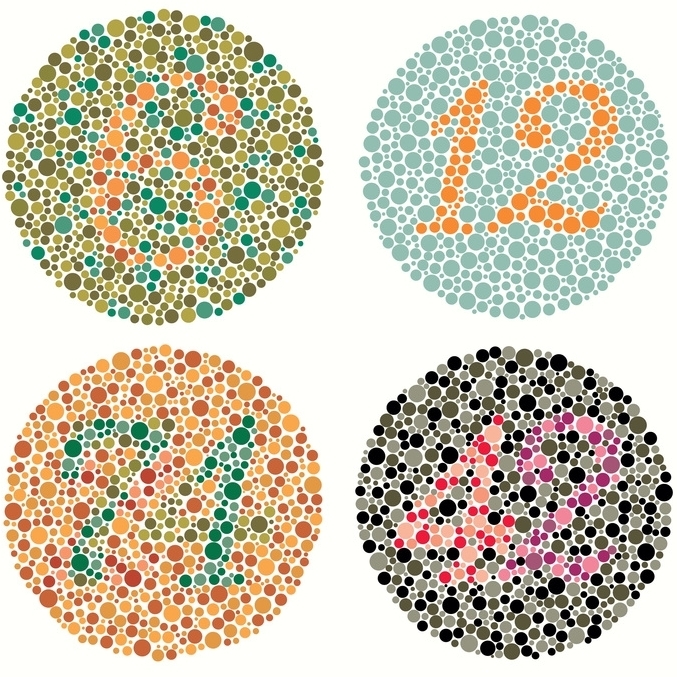 Every comprehensive eye exam at Stonewire Optometry starts off with a basic colour vision screening. This is because approximately 5-7% of men have some form of colour vision deficiency, which might help to explain some of our bad fashion choices we make. Women can also have colour deficiency problems, but it’s certainly much more rare but always worth noting. That’s because most colour vision problems are hereditary in nature, but occasionally colour vision deficiency may be a sign of an ocular disease or side effect of a medication. As such, we always want to know if the problem is new or long standing. Unfortunately, most men never realize that they have a colour vision problem and only discover it during a job application physical. The police department, fire department, Canadian National Railway, Canadian Pacific Railway, Air Line Pilots, welding inspectors and a host of other professions all require successful candidates to possess adequate colour vision. As such, it’s often a very negative moment in eye care when an optometrist has to inform a patient that they don’t meet the vision requirements for their dream job. Currently there is no treatment or cure for colour deficiency. However, this may not be the case for long. A recent study performed between the University of Washington and the University of Florida was able to restore colour deficiency through gene modification therapy in monkeys. Stonewire Optometry in Kingsway Mall Today! In Eye Exams, eye conditions Tags Did you Know? Pink eye can also be related to some more serious eye conditions like scleritis, uveitis, or iritis. These eye conditions require more urgent care, and will generally not resolve on their own if left untreated. School vision screenings are a critical component of our health care system and help to detect gross visual problems in children that may otherwise go undetected. School vision screenings however are not a substitute for a comprehensive eye examination by an optometrist. All children, 3 years of age or older, should receive a complete eye examination at least once a year. An optometrist can examine your child to ensure that they have the adequate visual skills needed to succeed at school. With almost 80% of all learning being visual, it is critical that your child’s visual system be operating perfectly. An eye examination by an optometrist is more then about 20/20 vision, it’s also about having proper visual skills. Some of these skills include colour vision, depth perception, focusing, eye teaming, and eye tracking. Children are covered under Alberta Health Care for a comprehensive eye examination once a year. There is no cost to you as a parent to have your child’s eyes examined by an optometrist. Children are also covered under Alberta Health Care for emergency eye exam appointments for things such as: pink eye, eye infections, allergies, injuries, etc. Dr. Ross McKenzie is a member of the Alberta Association of Optometrists and is proud to participate in the Eye See…Eye Learn program. A partnership between optometrists, private business and the Alberta Government with a focus on ensuring that every child receives an eye exam before starting kindergarten. To learn more about the Eye See…Eye Learn program please refer to the Alberta Association of Optometrists website. eye-bar in Sherwood Park now offer complete optometric eye care services. To book an eye exam with one of the optometrists at eye-bar please call 780.467.3341 or visit eye-bar.ca for more information.